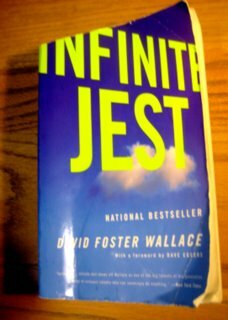 Infinite Jest is about family, addiction, and addiction—that is to say, it can get raw and alarming pretty fast. I knew that. Somehow I didn’t connect the punch-in-the-gut hallucinatory nature of the end of the book with a small yellow humming box, filled with people, lurching quickly underground. I also didn’t realize that instead of 100 pages left, I had about 180. I made it to page 120 before deciding that it had been adventurous enough already. It was just too much, in too well-chosen an environment. It felt like my head was filled with silver pom-poms. My ears were buzzing, and I became somehow convinced that if I kept reading, I’d give myself chronic motion sickness and no longer be able to read on the T (a hypothesis which seemed to make good sense at the time). It would have been a pretty intense couple of chapters even if I’d been reading them in my room, which I know, because I read the last few in my room . I’d worried that I’d have to wait until the next weekend to have that kind of time on my hands, but luckily we had a “snow day”—in reality just a rain-with-a-couple-of-snowflakes-day. The end of the novel took place in Boston in the middle of a blizzard; I finished it, in Boston, waiting for a snowstorm that never arrived. Although the adventure didn’t go quite as planned, I don’t know when I would have buckled down and gotten through if not for that goal, and I’m really glad I did.